The Baton Rouge Children’s Advocacy Center, are fortunate to have a highly trained team of professionals that meet weekly to respond to child abuse reports. This community of professionals collaborate in a team approach referred to as the “Multi-Disciplinary Team.” Much like six lanes of traffic on the freeway, they operate independently in separate lanes, yet crossing over when needed to do so to coordinate the care of a child victim. Their goal is to successfully investigate and resolve cases of abuse while keeping the child’s needs and best interest as the paramount importance. The services provided and the roles of the team members are described below. Click the numbers in the house to see these roles. Also known as our “Trauma Response and Recovery” program, it is comprised of a team of licensed master’s level therapists who are specially trained in Trauma-Focused individual, family and group therapies. Mental health professionals (therapists) on the team help decide how the abuse has affected the child and family and what can be done to assist them in healing from the experience. Additionally, the therapists provide trauma-informed therapy and counseling services to aid in coping with the trauma. The forensic interviewer is a competently trained, neutral professional. A forensic interview of a child is a developmentally sensitive and legally sound method of gathering factual information regarding allegations of abuse or exposure to violence. The Forensic Interviewer is a trained professional who is responsible for providing child friendly forensic interviews of children and adolescents when there are suspicions of abuse or when the child has been a witness to violence against another person. The Forensic Interviewer will meet with your child so that your child can provide a statement about what happened. Our team of medical professionals consists of a network of physicians and Sexual Assault Nurse Examiners (SANE) who provide medical exams when necessary. Planning is underway for a future onsight exam room. Depending on what may have happened to your child, a medical exam may be requested by the investigative team. The Medical Director may conduct a medical exam to evaluate and collect evidence from the child. This exam, performed in a child friendly room, is not invasive or painful. Medical exams are performed to assess for and treat STD’s and injuries, evaluate for pregnancy, and to document trauma. More importantly, exams help to reassure the child that his or her body is okay. Regardless of when children are evaluated, most children will have normal examinations. This does not mean that no sexual abuse has occurred. It is possible that children and teens have been involved in sexual activity without injury or lasting signs. Our partners in law enforcement are often the first to respond to allegations of child abuse. Their role is to ensure the safety of the public and to investigate cases of abuse. The Police Department and Sheriff’s Office have investigators on the team. They interview non-offending caregivers, suspects, and other witnesses, and they gather evidence from the scene of the alleged event. Prosecutors investigate alleged crimes in cooperation with law enforcement, and file criminal charges or bring evidence before the Grand Jury. Prosecutors represents the parish government on behalf of the District Attorney’s Office to enforce state and local laws. The prosecutor leads the team, which decides whether charges will be filed. Consideration is given to many factors which will affect the likelihood of success in court. Some of the factors considered are age and maturity of the child, the child’s ability to testify, whether or not the suspect has admitted to the allegations, presence of medical evidence, and whether or not there are other witnesses. The Victim Advocate from the DA’s Office is a trained professional who helps the caregiver when abuse is reported. The Victim Advocate helps the caregiver connect with services in the community and provides education and emotional support as the caregiver protects the child in the aftermath of the abuse report. The Victim Advocate coordinates the court preparation, helps victims and their families understand the legal process, and provides other valuable services to victims and their families. The Family Advocate is a support specifically for Non-offending Caregivers. Family Advocate is a part of the CAC team and is present during the Forensic Interview process. The Advocate will meet with the caregivers at the same time the child is being interviewed in order to completed a Care Coordination Profile. 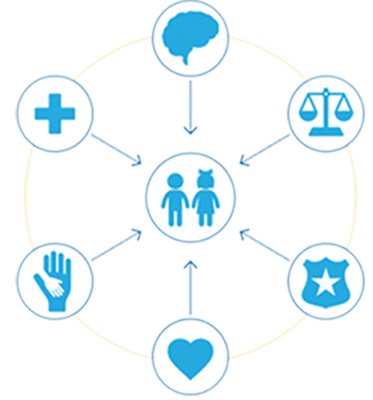 Care Coordination profile allows the Advocate gather information about family and child and identifies needs of the family. This part of our program operates separately from the MDT but is nonetheless critical. The goal of prevention and community education is to prevent abuse before it happens or to identify abuse cases earlier to promote better health outcomes. We aim to find it early or prevent it altogether. Our team of prevention and education specialists offer free education and training in the subject of child abuse prevention, trauma-informed responses to childhood trauma, and online and internet safety. We target our education programs to both children (Pre-K – 12) and the adults who care for them in programs such as Darkness to Light and Speak Up Be Safe. Click here to learn more about our education. Our partners at the Department and Children’s and Family Services (DCFS) work to ensure that children are safe. Through the investigation, implementation of safety plans for children and their families, and follow up interactions, DCFS workers work to help ensure children remain in safe environments. The role of the Department of Children and Family Services (DCFS) is to help protect your child. The DCFS case workers conduct interviews and develop safety plans. They may refer you and/or your child to counseling and continued services to help the child and family. To understand what a CAC is, you must understand what children face without one. Without a CAC, the child may end up having to tell the worst story of his or her life over and over again, to doctors, police, lawyers, therapists, investigators, judges, and others. They may not get the help they need to heal once the investigation is over, either. When police or child protective services believe a child is being abused, the child is brought to the CAC—a safe, child-focused environment—by a caregiver or other “safe” adult. At the CAC, the child tells their story once to a trained interviewer who knows the right questions to ask. 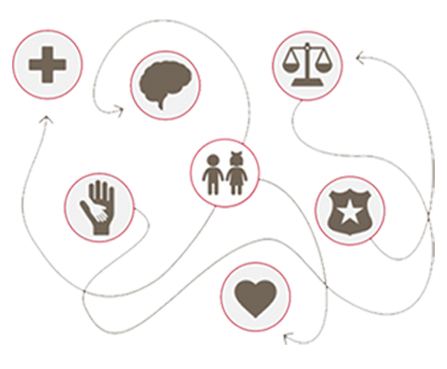 Then, based on the interview, a multidisciplinary team (MDT) that includes medical professionals, law enforcement, mental health, prosecution, child protective services, victim advocacy, and other professionals make decisions together about how to help the child. Finally, they offer a wide range of services like therapy, medical exams, courtroom preparation, victim advocacy, case management, and more.